Music is powerful in a special way that it calms our mind and body. With the trend of keeping everything in the cloud nowadays, our media library is changing this way as well. There are a variety of online radios or streaming sites such as Pandora, Rhapsody, Rdio, GrooveShark, and Last.Fm. All provide different purposes and work well in their own ways. However, I have become hooked. While I do not claim to be a critic, nor am I an expert in design or usability, I hope to share why Spotify works for me from the perspective of both a technology enthusiast and a musician. First, I love Spotify’s library! I listen to music for both enjoyment and studies. Since I don’t exactly listen to main stream music, I have had a difficult time finding various interpretations of specific sonatas, etudes, or concertos on other services. With Spotify, being able to find Martha Argerich’s Prokofiev Piano Concerto No. 1 in an instant is perfect for me. Users need to download a desktop client. Initially I cringed at the idea of downloading yet another application (which I probably wouldn’t use for long, I thought.) Now I have to admit that I do like its simple music player design. 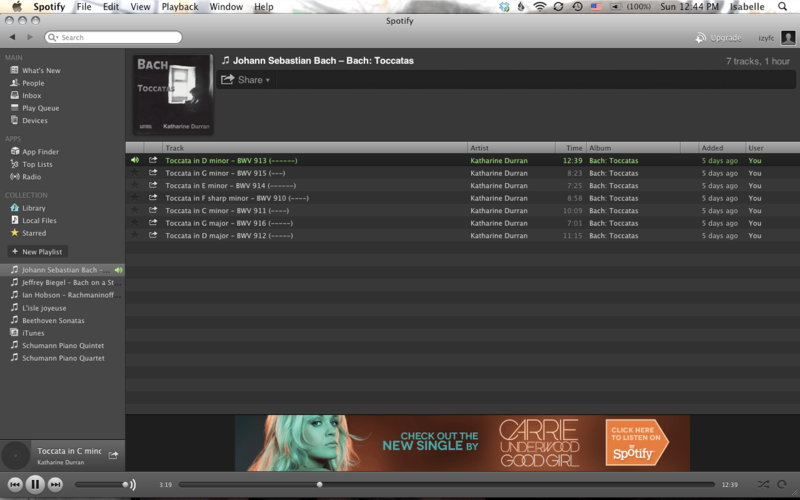 It is intuitive – Spotify lays out the main functions on the left column with the library displayed on the right side. I like being able to search for a specific piece, decide on a particular artist from the list, and add it to my “queue.” Sure, that probably is a common thing for streaming media sites. Sometimes I find the exact album I’m looking for, and I add the entire album to either the playing queue or to my playlists. The playlist function is intuitive and useful for when I’m researching on music, and it serves almost like a bookmark when I need to go back to it. The other day, I was selecting a J.S. Bach Toccata for my new repertoire. Since I had trouble deciding between three (e minor, g minor, and D major), I found a CD by Durran on all Bach’s Toccatas and added the album to my playlist. As soon as I did this, Spotify automatically pinned the album on the left column under “playlists” with the artist and album name, so I could easily go back and make my choice later on. Users may share the music they are currently listening to via social networks such as Facebook and Twitter. This links to a direct URL of the piece you are listening to, so users can be directed to the song or piece. For me, the wide selection of music is my favorite part of Spotify. I have been able to find just about every piece or song I search for. I leave the application open in the background, or I find particular pieces for studying and analyzing purpose near the piano. Do you prefer using an online music library service like Spotify, or an online music radio? What works for you? This entry was posted in San Francisco and tagged isabelle, music, san francisco, spotify, thrive. Hi, I stopped buying albums on iTunes and now have a premium subscription with Spotify. I love pretty much everything about Spotify, but I found that I didn’t like the way it handled albums. Creating a playlist for each album I wanted was quite inelegant and didn’t give me the sorting options that I used to have in iTunes. I also missed the grid of albums, like having the CDs on my shelf. I was just thinking that we needed women writing about tech on this blog. Well done!